Article by the Turkish section of the ICC outlining the nature of the recent events in Tunisia, Egypt, and Libya and across the Middle East and trying to draw an understanding of the current situation internationally. 1. What is going on and why it is important to understand it. ‘Revolution’, today with the events currently going on in the Arab world this seems to be the word on everybody’s lips. The first thing that it is necessary to understand when discussing the subject is that not everybody means the same thing by it. The term revolution seems to have been completely devalued today so that any change of bosses is deemed a revolution, from the ‘Rose Revolution’ in Georgia to the now called ‘Lotus Revolution’ in Egypt, where not even the bosses have changed, with seventeen of the old twenty-seven cabinet members still in government, we have been treated to a whole series of so-called ‘revolutions’ by the media; the ‘Orange Revolution’ in the Ukraine, the ‘Tulip (or Pink) Revolution’ in Kyrgyzstan along with the ethnic cleansing that accompanied it, the ‘Cedar Revolution’ in Lebanon, the ‘Purple Revolution in Iraq (this one was actually a term used by Bush, which didn’t catch on at all), and the ‘Green Revolution’ in Iran, the list goes on and on. For us as communists, a revolution is not just the change in management of the current system. It means a fundamental change of the system and the overthrow of the capitalist class, not just a change of faces. That is why we completely reject the idea that what is happening today in the Arab world and Iran are in any way revolutions. If they are not revolutions though, it raises the question of what the nature of these events actually is. It is not only the mass media that is talking about revolutions but also many of those on the left as well. Are they all wrong? And if they are wrong what do these events mean for the working class? 2. Putting the events into a historical context. If we are to try to understand current events, it is necessary to be able to place them in a historical context. It allows us to understand the balance of power between different classes, and the dynamic of the situation. Certainly over the last decade the working class has began a slow return to combativeness after the dreadful years that were the nineties. However, it would be a terrible mistake to think that class struggle today is at the same level that it was in the 1980s, let alone the 1970s. While the past ten years has shown the beginning of a return to class struggle, it must be recognised that it is a very slow process. To put it into context we must look back a few years. The wave of international struggles that began in 1968 were reaching a crescendo at the end of the 1970s. The mass strike was a very real possibility internationally. Possibly the three high points of the period, in chronological order, were the ‘Winter of Discontent’ in the UK in 1978-799, the mass strike in Iran in 1978-79, and the Polish strikes of 1980-81. The defeat of these movements was catastrophic for the working class, and led to the years of the 1980s being years of, not a general class offensive, but of defensive actions. The struggles of the 1980s although at times very intense, essentially involved different groups of workers being picked off, isolated, and defeated. The period also saw the rise of neo-conservatism, represented internationally by Reagan, Thatcher, and Kohl, and in this country by Turgut Özal. The end of the decade saw the collapse of the Soviet Union, and the whole ideological campaign, which accompanied it, with bourgeois academics and ideologues proclaiming the end of both class society and even the end of history. How wrong they were, yet for a very, very short while it could have seemed like that, and the lack of class activity in the 1990s only emphasised the point. By the turn of the century it was becoming obvious that things were not ging the way they imagined. After Saddam had been defeated for the first time, and this new era of global peace had broken out, the rest of the decade, after the end of history brought over fifty wars across the world, and as the crisis deepened, not openly as in the past few years, but slowly, creeping up, hitting some countries like ours and Argentina dramatically, we began to see the working class return to struggle. Of course it came slowly, ten years without class struggle, after ten years of defeat had taken a terrible toll on the working class. A lost generation, remember how people said in Turkey “Don’t talk about politics, it is dangerous”, meant a loss of vital experience within the class. Although the last decade has seen this slow increase in struggles, they had still until very recently still been generally struggle of isolated groups of workers. The past few years, however, have seen a growing realisation that in order to win workers have to fight together. Witness the TEKEL movement here, or even in Americas, for so long a backwater of class struggle, generalised attacks are leading to a generalise response with masses of workers supporting Wisconsin teachers, and many calls for a general strike. It is in this framework of understanding that we have to try to comprehend the events going on today, and too do this we need to look at a couple of recent large scale struggles. 3. Putting the events into the context of recent struggles. The current struggles in the Arab world are, in our opinion, certainly not struggles where the working class is the leading force. This does not mean that masses of workers are not participating in them, but that the working class has not been able to assert itself as a class, and has ended up being dragged along within an agenda set by others, and in Libya today we see the disastrous consequences of this with workers on both sides enthusiastically joining up with what is effectively a civil war on behalf of different bosses. We think that it would be instructive at this point to try to situate the events in relation to the recent movement in Greece and Iran. The movement in Greece in December of 2008 erupted after a fifteen year-old anarchist was shot dead by two policemen on a Saturday night. Within an hour of the murder violent confrontations with the police had begun in the area around Exarcheia Square in Athens, an area which is traditionally a stronghold of the anarchist movement. By the end of the evening confrontations had occurred in nearly thirty different locations across Greece. The next day the demonstrations continued, and on Monday morning thousands of high school students walked out and demonstrated outside of police stations. On the Wednesday following the shooting there was a general strike involving over a million workers. This strike, however, was not in response to the murder or the demonstrations, but had been organised prior to these events. In fact the country at the time was also in a period of large scale labour unrest due to the government’s economic policies. It is in this context that we need to try to understand the weakness of the Greek movement. Despite their being widespread anger against the government’s policies and the mass protests over the murder of a child, the two never seemed to connect. The only strike in support of the protest movement was a half day strike of primary school teachers. Although there were of course many workers involved in the protests, the workers did involve themselves as workers, but on an individual level. This is not to say that attempts weren’t made to link the struggle to the working class. Militants occupied the HQ of the General Confederation of Greek Workers in Athens and called for a general strike. And yet the working class didn’t move as a class, and ultimately the protests died out. We see this as a recurring theme in today’s struggles, large scale protest movements without any real input from the working class. If we go back to the struggles that we mentioned earlier, in the UK, Iran, and Poland, it is clear that the working class played a central role. In these struggles today that is not the case. Why it is not the case and what it means for struggles in the current period is a crucial question. Before we attempt to analyse it, we will first look at another example, the struggles in Iran following the elections of the summer of 2009. In June 2009, following allegations of electoral fraud, mass demonstrations broke out in the streets of Tehran, and rapidly spread across the entire country. The state reacted viciously and unleashed its repressive forces resulting in hundreds of deaths. Whilst the initial protests were clearly fermented by anger caused by the obvious fraud in the elections, more radical slogans began quickly to emerge. Similar to the movement in Greece we saw massive violent clashes with the forces of the state, this time on an even larger scale, but again we saw workers involved as individuals and not as workers. Although information was hard to come by, it seems that there was only one strike, at the Khodro car factory, which is the biggest factory in Iran, all three shifts walked off for an hour each, in protest against state repression. As in Greece the movement on the streets lasted for a few weeks and then faded out. In March of 2007 there were massive workers struggles, which started with a 100,000 strong teachers strike, and spread to many other sectors continuing for months. Yet two years ago the working class didn’t move despite the massive repression the state unleashed against the demonstrations, most of the participants in which were working class people. Without the strength of the working class behind them, movements such as this have a tendency to wear themselves out. If we look back to the period at the end of the 1970s in Tehran, by the autumn of 1978 the movement seemed to have exhausted itself. A popular movement, similar to those we see today, including all of the disposed, but also other classes seemed to be running out of steam. It was in October when the working class entered the struggle with massive strikes, particular those in the vital oil sector, that the situation changed, and revolution seemed to be a real possibility, workers councils were formed and the government fell. After Khomeni took power, the state spent the next few years struggling against the workers committees in the factories. Of course, we could have talked about other popular struggles, the ‘Red Shirt’ movement in Thailand being a prime example, again another mass movement mobilising tens, even hundreds of thousands of people, many of them workers, against the state, another movement that lasted a few weeks, and then burnt out, and another movement where workers weren’t involved as a class. 6. What were our perspectives before the movement in the Arab world? How did we characterise the period before the recent series of revolts that has spread across the Arab world, and to what extent were we right? Basically we perceived of the current period as one in which the working class was slowly recovering its will to struggle. The reopening of open economic crisis across the world in 2007, certainly changed this dynamic somewhat, but not substantially. It is very clear that it caused a momentary dip in working class confidence with workers being afraid to struggle due to the possibility of losing their jobs. However this can be counterbalanced by the vast number of workers who were forced to struggle due to the severity of the bosses’ economic attacks. Also important was the lack of experience within the working class itself, and the lack of workers consciousness of their power as a class. The mass outburst of struggle in countries including, but not only, Greece and Iran were seen in this context. The mass austerity programmes taking place across the world were seen as likely to force the working class into struggle and not only the working class, but also other disposed classes, witness the mass food riots in various countries across the world in 2007-08. However we believed that the working class was not yet strong enough to take a definitive role in these struggles. Of course, it was always possible that something could happen and the working class would impose itself on a struggle. “The day before a revolution nothing seems more unlikely. The day after the revolution nothing seems less likely” said Rosa Luxemburg. However we felt that the development of working class consciousness and strength would be a slow process, punctuated by mass revolts where the working class would be unable to play the central role. Then on 17th December last year a young man burnt himself to death in idi Bouzid in Tunisia, and the world seemed to change. Following Mohamed Bouaziz self-immolation outside the town hall hundreds of youths gathered to protest and were met by tear gas and violence. Riots broke out. As the scale of the protests increased the town was sealed off by the state. It was too late though the fire had already begun to spread. Four days later there was rioting in Menzel Bouzaiene, and within a week in the capital Tunis. After 28 days President Ben Ali had run off to Malta on the way to his new refuge in Saudi Arabia. The thing that we need to analyse here as communists is the class nature of this revolt. Many commentators in the mainstream press have drawn an analogy with the events of Eastern Europe twenty years ago when the bosses were changed across eastern Europe, and with the more recent ‘colour revolutions’. For us the class nature is of central importance. The causes of the revolt seem to be widespread discontent amongst the working class, mass unemployment and low wages as well as anger against a kleptocratic government. Certainly the demands of the movement were centred on working class demands concerning jobs and wages, and of course anger at the resulting police repression played a huge part. Mass youth unemployment and a overwhelmingly young demographic lead to much of the movement being centred around rioting and street protest of, mainly, unemployed youth. However, there were also big workers strikes particularly amongst teachers and miners as well as a general strike in Sfax. The state also used lockouts in the attempt to stop the strikes spreading, a tactic that we will see used again in Egypt. Also we saw the UGTT, the regimes union confederation, taking the side of the struggles and seeming to ‘radicalise’, a sure sign that there was widespread struggle amongst the working class. It seems clear to us that in the events in Tunisia, although not exclusively, represented on the whole a working class movement. In Egypt this would be less so with the working class still playing an important role, and in Libya the working class would be conspicuous by its absence. To return to the events in Libya though, after the fall of Ben Ali, a ‘Unity Government’ was announced, with 12 members of Ben Ali’s RCD, plus the President and Prime Minister who had just quit the party in an attempt to gain credibility, , three representatives from the trade unions and a few individual representatives of small opposition parties. Despite the Prime Minister’s assurance that all members of the RCD in the government had ‘clean hands’, the protests continued. The union representatives resigned after a day in office, obviously keen on keeping their new found credibility, and the rats started to leave the RCD like a sinking ship with its central committee disbanding itself on the 20th. And as protests continued in Tunisia and people continued to protest, and governments continued to fall, a spark had been lit. Algeria saw the first signs of flames with large scale rioting hitting many cities in early January, but it was in Egypt that the fire really started to burn. The first protests were held on National Police Day, 25th January. The protests were widely advertised on social media, and particularly through Asmaa Mahfouz’ , a female journalist, you tube video going viral. The media have picked up on all this calling it a ‘FaceBook revolution’, but it is worth remembering that hundreds of thousands of leaflets were also distributed by various groupings. 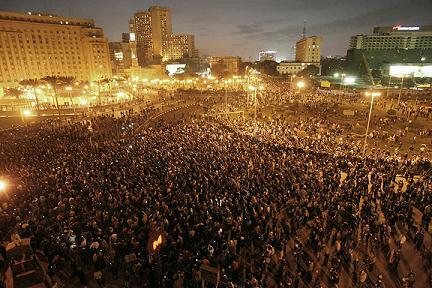 The protests on the 25th drew tens of thousands of people in Cairo, and thousands of others in cities across Egypt. As the movement grew there became a real possibility of Mubarak falling just as Ben Ali had done. The government closed workplaces with a clear intention of stopping workers strikes breaking out. There seemed to be splits within the state as the military as an organisation, not individual troops on the ground, refused to fire live ammunition. Mubarak promised to form a new government, then promised that he would step down at the next elections in September. Meanwhile the protests continued. On 2nd Febuary, the ministry of the interior organised an assault of the demonstrations by Mubarak loyalists. The army stepped in, although at times somewhat half heartedly, to divide the twp sides, clearly preparing the way for if Mubarak was forced to go. The next week, the reopening of workplaces meant the reopening of workers strikes Workers in many different industries in Cairo and across the delta began strikes. These strikes and the very real possibility of them spreading seemed to be the final point that convinced the military that Mubarak had to go. On the 11th of February, the military’s representative new Vice President Omar Suleiman announced that Mubarak had resigned and two days later the military enacted a constitutional coup. Strikers were instructed to go back to work, and strikes were forbidden. For a while they continued, but then went back to work mostly after winning wage increases and concessions. The class nature of the Egyptian events seems different from those in Tunisia. While the movement in Tunisia seemed to have a mostly working class character the events in Egypt seemed to have a wide cross class character encompassing all social classes. Whilst the working class played an important role, possibly even a crucial one, it was never the leading force. Many on the left talked about their being a mass strike in Egypt. The protests in Egypt saw many more workers strikes than the struggle in Tunisia. We can put this down to Egypt having a more experienced and militant working class. While we believe that the potential for the mass strike was there, and that it was quite possibly this that scared the military into dumping Mubarak when they did, we don’t believe that it materialised. All in all around 50,000 workers were involved in strikes, over 20,000 of them at one factory. While this demonstrates an important movement it was not the mass strike, and was not even on as big a scale as the strike wave in Egypt a few years earlier. The speed with which the movement dissipated showed that it was not as strong as many on the left were saying. The protests in Libya began on 15th January, and from the start it was clear that these were very different in their nature. The thing that started the protest was the arrest of Fathi Terbil, a lawyer representing Islamicist militants murdered in a massacre in a prison, in Benghazi. Police violently broke up the protests in Benghazi, but that didn’t stop them from spreading to nearby al-Bayda, as well as Az Zitan near to Tripoli in the West. In an effort to make concessions as the demonstrations spread the state accede to some of the protestor’s demands and realised 110 members of al-Jama’a al-Islamiyyah al-Muqatilah bi-Libya, a Jihadi group from prison. Still the protests continued. The state reacted in an extremely violent way with death squads used to demoralise the protestors. Massacres were reported on both sides as senior Islamic figures and tribal leaders issued declarations against the regime, and called for the government to step down. By now protests had spread to the west where demonstrations in Tripoli were crushed viciously by the state. In the South the Tuareg people were called into the revolt at the request of the powerful Warfalla tribe. On the 22nd Gaddafi appeared on state TV to deny reports that he had fled to Venezuela, and vowed to fight “until the last drop of his blood had been spilt”. The next day as demonstrations grew in size and many tribal leaders, who had been previously silent started to call for Gaddafi to go, William Hague the British foreign minister, first started to talk about ‘humanitarian intervention’. By this point the situation had clearly developed into a civil war. And where was the working class in all of this? To a large extent Libya, like many of the Gulf oil states, relies on foreigners to do the majority of its manual jobs. The vast majority of the working class in Libya was desperately trying to get out of the country as the situation deteriorated and the violence increased. Unlike in Tunisia, and Egypt, the working class didn’t appear to play a significant role in any way. The movement from the start seemed to be dominated by Islamicism and tribalism. There were no workers strikes that we know of, and the one report of an oil strike in the Arab media was later shown to be just the management closing down production. Of course there are Libyan workers too. Evidently though they were too weak to play any role in these struggles as a class. That doesn’t mean that workers had no role at all in the events. The demonstrations that took place in Tripoli all seemed to occur in working class districts. However the working class was too weak to assert its own interests and have basically been used as cannon fodder in a civil war in which they had no interest, and are now dying under the bombing raids of the US and its allies. Before we continue with the story of how the war developed and how the imperialist powers became involved, we will quickly look at what was going on in other Arab states. The first country to follow Tunisia’s lead was neighbouring Algeria. Protests started there on 3rd January in response to increases in the price of basic foodstuffs. Whilst isolated riots have been common in Algeria over the past few years, these were different in that they spread over the entire country within a week. The protests were virtually entirely around class demands, and were beaten back by a mixture of repression and concessions. In January large scale protest also began in Jordan and Yemen. In Jordan protests against high prices inflation and unemployment were organised by the Muslim brotherhood. It ended up in the King changing a few faces in the government, and having to make wide-reaching economic concessions. The protests in Yemen are still continuing as we write. It currently seems that the military is in the process of changing sides with Ali Mohsen al-Ahmar , a leading general infamous for massacres in the 1994 civil war switching to the side of the protestors. Outside of the Arab world Iran and TRNC have also seen protests with a revival of the ‘Green Movement’ in Iran and protestors shot dead in the streets. Bahrain has also been another focal point of demonstrations eventually resulting in Saudi Arabia and the Gulf co-operation council sending in troops to help to ‘stabilise’ the situation as the Bahraini state unleashed its repressive forces against demonstrators. The movement in Bahrain seems to have taken more and more of a sectarian dimension with members of the Shia majority which was the leading force in the protests against the Sunni monarchy, now openly calling for Iranian intervention. Also protests in the Northern Shia majority areas of Saudi Arabia have been held in support of the Bahraini rebels. Bahrain has also seen attacks launched upon foreign workers, mostly from South East Asia by the demonstrators. Events of this sort have also been reported in Libya. Finally the Syrian army has just massacred 15 protestors outside a mosque in the small southern town of Daraa, which has been the centre of the protest movement due to local anger about the arrest of a group of children in a school for writing pro-Egyptian revolt graffiti on a school wall. Virtually unnoticed amongst all of this has been the protests in Iraq, where a minimum of 35 people have been murdered by the state. Of course Iraq is already a ‘democracy’ occupied by US military advisors, which is probably why these murders received less news coverage than others. Now to return to Libya where today we have a full scale NATO bombing campaign going on. Of course it isn’t the first time that Libya has been bombed by the Western powers. Nor was the 1986 bombing of Tripoli by the US the first time. In fact the first time aerial bombing was used in history was 1911 by the Italians in the Italio-Turkish war. The Italians soon update from using bombs to chemical weapons. At the end of February it looked like Gaddafi had lost the initiative, but by the middle of March, he had regained the upper hand with thirteen of the country’s twenty two districts back under state control, and two more seeming that they were about to be retaken. The road to Bengahzi seemed to be open, and the end of the rebellion in sight. It was at this point on the 17th of March that United Nations resolution 1973 was passed authorising a ‘no-fly zone’. After getting a poorly attended Arab League meeting with only about half of its members present to back to bombing campaign to give it some sort of ‘legitimacy’, the military operations are now under NATO control with the Arab League criticising the bombings that they called for. It seems like they, like much of the world, had somehow imagined that a ‘no-fly zone’ would just involve shooting down any aircraft trying to bomb civilians, and not a mass bombing campaign murdering civilians. It almost as if Iraq had never happened. For those with short memories 110 Tomahawk missiles and bombing raids by the British and French air forces on March 19th would have acted as a sharp reminder. Now it is clear, beyond any doubt, that the events in Libya have degenerated into an all out civil war with workers on both sides being massacred on behalf of those who control, or would control Libya. 12. Where are we now? It seems now that the reaction has firmly set in. The events in Libya show only the worst extent of where the weakness of the working class, and its inability to impose itself on the situation have left us. How resilient the Gaddafi regime will be and whether it can hold on remains to be seen. We think that it should be remembered that back in the middle of February people were only giving Gaddafi a few days, yet he is still in power in Tripoli. We suspect that he will hold on for longer than the West imagines. At the moment he is appealing to the idea of protecting the homeland and national defence. The Warfalla tribe, over a million strong and nearly 20% of the population are now pushing for reconciliation, claiming almost unbelievably that no significant tribal figures are involved in the rebellion. As loyalties shift to and fro large amounts of cash are said to be changing hands. In Yemen it is becoming increasingly clear that whoever ends up on top it will just be a reshuffling of leaders. Bahrain has seen another rebellion crushed just as the one back in the 1990s was. Syria will probably manage to ride out the protests even if it takes a few more massacres. After all those who remember the tens of thousands of civilians murdered in the city of Hama at the start of the 1980s know that the Assad regime isn’t adverse to a bit of blood. And so it seems that a movement which began in Tunisia is now drawing to a close. That isn’t to say that there won’t be more murders of protestors, or even the odd dictator falling, such as Ali Abdullah Saleh in Yemen, to be replaced by a military strong man. However the movement that erupted at the end of last year with such promise seems to be over, or at least dead to the working class. 13. What conclusions can we draw? For us our general analysis of the period remains unchanged. The working class is returning to struggle slowly but surely, but is not yet strong enough to stamp its imprint firmly onto the times. We expect that the future will show us more struggles along the lines of the revolts in the Arab states and those previously in Greece and Iran. As the economy continues to stagnate, a process that cannot but be aided by the increase in oil prices caused by an ongoing war in Libya, and the massive withdrawal of capital to Japan that is almost bound to happen in the aftermath of the earthquake and tsunami of March 11th, states will have no other solution but to resort to increasing austerity and increasing repression. The working class in some of the Arab states, most notably Tunisia and Egypt, but also Algeria has made a step towards recovering its experience of how to struggle. In others the weakness of the working class has been brutally exposed and the resulting repression and increase in sectarian tensions, not to mention Libya being dragged into a civil war will almost certainly act as a weight around the neck of the working class. Those on the left who talked of workers’ revolution in the Arab world have been shown to be wrong. The working class is still to week to assert itself. The road to rebuilding the lost experience and class consciousness will be long. Yet there are reasons to hope. The speed with which the Egyptian military jettisoned Mubarak after workers strikes broke out shows that the ruling class, at least, is still well aware of the potential that the working class holds, and in a far away country where working class struggle has for years been conspicuous by its absence, workers in Wisconsin fighting against cuts in the largest struggle the US has seen in years raised banners supporting Egyptian workers implicitly recognising that the class struggle is an international one of workers across the world facing the same sort of attacks. If the rest of the ICC could make an analyisis (based on a material evaluation of class forces) like this it would be a positive contribution to discussion. We in the ICT could certainly see this as within our frame of reference (whatever minor points any single comrade might wish to add or subtract). As it is this article is presented on the ICC site as an "alternative view" (i.e.not the Paris centre's idealist view that workers' resisitance is greater than it is) and the introductory remarks also add the fatuous comment that the situation in Libya is still "fluid" (i.e. open to some proletarian development) when the text presented here demonstrates clearly the reality that we are deep into an inter-imperialist conflict predicated on tribal warfare in Libya. Congratulations to the Turkish comrades of the ICC on this text. Thanks Devrim. A fascinating article. Cleishbotham: the introduction on the ICC website says that the situation in the Middle East in general in still "fluid". It's not referring specifically to Libya. The article we have published in the latest WR and RI says that the developments in Libya - the explicit outbreak of an inter-imperialist war - represent a blow against the working class and oppressed of the whole region, without concluding that the blow has been decisive for workers in the whole region. You may disagree with the general article we have published ('What is happening in the Middle East'); it doesn't claim to be the last word. You may think that it overestimates the class struggle. But calling it 'idealist' doesn't add anything to the debate, nor does the idea that it's simply the view of the 'Paris centre'. As it happens, the text was not written in Paris at all. Cleishbotham: the introduction on the ICC website says that the situation in the Middle East in general in still "fluid". It's not referring specifically to Libya. It comes across as a bit ambiguous. Yes, that 'someone on RevLeft' was me. After re-reading it, its clear that you were referring to the general situation in the Arab world. But even then I think the 'still very fluid' characterisation is problematic, in that from the perspective of the working class asserting its own agenda is the situation 'still very fluid'? In the sense that the working class in Egypt and Tunisia - which are clearly the most advanced fractions in the region, along with the the Algerian perhaps - have not suffered an important defeat like the workers and oppressed in Libya. The possibility of the struggle returning at a higher level remains, even if it's not an immediate prospect. But surely the term fluid suggests that things are still moving, very much a short term, if not an immediate prospect. Exactly. Surely describing the situation as being 'fluid' can only mean you are referencing a process is current and contains the possibility of immediate progression. The working class is still to week to assert itself. The road to rebuilding the lost experience and class consciousness will be long. Yet there are reasons to hope. The speed with which the Egyptian military jettisoned Mubarak after workers strikes broke out shows that the ruling class, at least, is still well aware of the potential that the working class holds, and in a far away country where working class struggle has for years been conspicuous by its absence, workers in Wisconsin fighting against cuts in the largest struggle the US has seen in years raised banners supporting Egyptian workers implicitly recognising that the class struggle is an international one of workers across the world facing the same sort of attacks. Agree with Android's last comment re the conclusion of the article. Re Alf and the idealist comment above it was deliberate as the question of method behind this text in contrast to most of the rest of the ICC output is quite marked. This text starts from what is not from what we would like it to be. The latter it seems to me is behind most of the texts that were written on the Egyptian situation (and the discussion on the ICC's forum that followed). When people ask me what are our differences this is for me the most significant but it is also theone that most people find difficult to take on board. And it goes back to the original perspectives that began with the ICC's "course of history" line. I don't know that this though is the best place to discuss this. It can work both ways though - the 'fluidity' can also mean that there is a danger of major repression and defeats. If you think that necessarily implies something immediate, then let's look for a different word, such as 'undecided'. I criticised the use of the term term 'idealist' because it was just thrown in with no explanation. In any case, there is no mechanical link between one's 'philosophical' method and the mistakes one makes in assessing the level of the class struggle, which is the main issue here. Both the ICC and the ICT have, from different starting points, made errors of both underestimation and overestimation of the potential of particular movements. Of course it can work both ways. My posts were manly in response to the ICC's over-exaggeration of the extend of working class struggle that accompanied the events in the Arab world, and particularily comments by Baboon and other ICCers on here. And I have not seen the ICC in published material or comments on here or on your forum posing 'fluidity' in terms of regression, this seems to be something you're introducing now IMO. But maybe I should re-read some of the material. However I am glad that you seem to have went back on your previous assessment now that the situation is a lot clearer. "Both the ICC and the ICT have, from different starting points, made errors of both underestimation and overestimation of the potential of particular movements. " I don't think they are of the same order. We have always maintained that the working class is in retreat (although always eager to see signs of the opposite). You began with the perspective that the counter-revolution is over and revolution just around the corner - that is a methodological problem (the course of history) that has hung like a yoke around your necks. It has given rise to all your barmy formula about waves of struggle, years of truth etc. It has also meant that it made you more anxious to recruit quickly and thus made you more sectarian against other organisations of the communist left. What I am saying is that this text and its methodological basis is something that brings the ICC back to a marxist materialist method which is closer to the real traditions of the Communist left. Please give us more. That's way too many assertions to answer in one post, and I'm not sure this is the place to continue this discussion about the differences between the ICC and the ICT. What would be a better place? Perhaps a better way to do it would be to go back to the traditional style where each organisation (the ICT with less frequency) publishes a polemic about the other in its press, which distorts the others positions, slanders them and insults them. The n again, we could look where that has taken us, and perhaps reconsider. personally I don't see any problem with doing it here. Well yes there are some strikes in Egypt. It is harldy a surprise In the years between strikes in al-Mahala and the movement in Tahir square, there wasn't a day without strikes. Workers still struggle. It is not the mass strike though as you portrayed it. Agree with Devrim here (and I put that article together).. I put it up because I think it's important to record and remember that workers struggle, not because a mass strike is happening (also, if you look, the energy strike was about energy workers being upset that their ministry hadn't gone through the same changes as other ministries since the 'revolution', so still about 'corruption' rather than their own material interests.. for now at least)..
Also, it's still not nearly on the level of what happened in 2006-2007 when there were strikes and occupations going on all over the place.. not sure if that would be considered a 'mass strike' either (don't really get the definition, is it just a 'really big strike in lots of different places'?).. I think the point Alf was making that the topic of this thread is the article - whereas a discussion about methodology and the whole history of discussions on those (and other matters) probably necessitates a separate thread. as opposed to the written polemics - really?? I would have thought there's about an, oohh 95%, more chance of 'distortions, slanders and insults' when people just post here as individuals reacting immediately to other peoples comments. More or less every thread where there's any kind of controversy ends up like that. It is not the mass strike though as you portrayed it. I must have missed that, please can you tell me where alf refers to the movements in Egypt as the mass strike? On the other hand, the title of this thread is 'Understanding the Period - Class analysis and events in the Arab world' so perhaps it is legitimate to discuss how we understand the period. I would agree that firing off immediate heated replies isn't a good idea. Is it ever? Perhaps we should try to avoid that. But a discussion of how we understand the dynamics of history is surely not out of place. No, I can't. It would involve me just searching through a load of posts as it would you. You could just ask him if he did say it, or even if he knows where he said it though. I think that Slothjabber is right on this, but threads go off on tangents anyway. It happens. I am a bit puzzled by this. I don't think my attitude has changed at all, and I had certainly read them all last time we spoke. I think that the chance of texts from either organisation have an exactly 100% chance of including 'distortions, slanders and insults'. Therefore a discussion on here can only have more chance of not including them, even if that chance is very low. - in the numerous attempts to fraternise with the rank and file soldiers. It is no accident that these tendencies developed most strongly in Egypt where the working class has a long tradition of struggle and which, at a crucial stage in the movement, emerged as a distinct force, engaging in a wave of struggles which, like those in 2006-7, can be seen as ‘germs’ of the future mass strike, containing many of its most important characteristics: the spontaneous extension of strikes and demands from one sector to another, the intransigent rejection of state trade unions and certain tendencies towards self-organisation, the raising of both economic and political demands. Here we see, in outline, the capacity of the working class to come forward as the tribune of all the oppressed and exploited and offer the perspective of a new society". I thought it got off to a great start. Me praising an ICC text! Or you could join the discussion on the ICT website on the article by our German comrades.